CLEARWATER, FL.---The strikeout woes continued for Dunedin as the Threshers pitching staff combined to strikeout 16 Blue Jays hitters in their first win of the season. Clearwater scored first against LHP Nick Allgeyer in the bottom of the first when Matt Vierling drove in two with a double. Roman Quinn, down on a Major League rehab assignment, ripped a homer into the bullpen area in left in the bottom of the third to extend the Clearwater lead to 3-0. Dunedin cracked the scoreboard in the visiting half of the fourth. Chavez Young doubled, and came around to score on the RBI single by Cullen Large to bring the score to 3-1. Madison Stokes drove in a run to add to the Threshers lead with an RBI groundout in the bottom of the sixth. 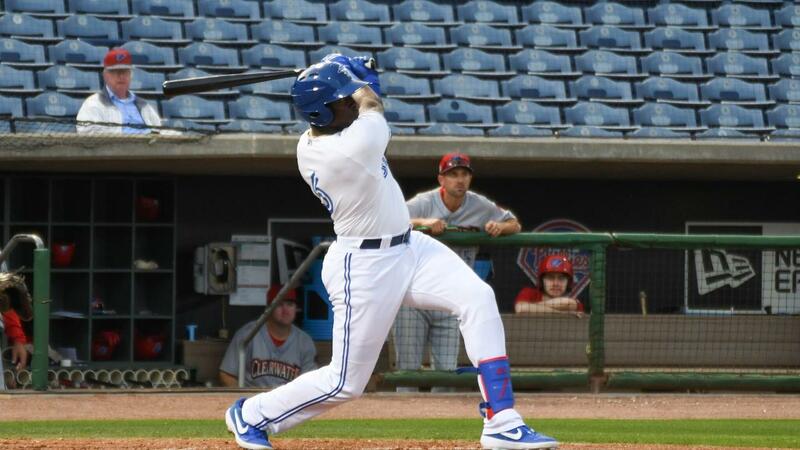 The Blue Jays final rally of the night took place in the top of the seventh when Logan Warmoth and Demi Orimoloye scored on wild pitches to pull to within one. Clearwater struck right back though in the bottom of the frame sending nine men to the plate against RHP Emerson Jimenez. Simon Muzzioti smacked a single to right to kickstart the rally. The Blue Jays issued the intentional walk to Roman Quinn to put two aboard for Jake Scheiner who ripped a double to ally way in left center to score Muzzioti. Jimenez then struck out Rodolfo Duran and Matt Vierling for the first two outs of the inning and looked to be on his way to wiggling out of the jam. Nick Maton though cracked a two-run single to right scoring Quinn and Scheiner. Madison Stokes capped off the rally by serving an RBI single to left to bring the score to its' final of 7-3. RHP Alejandro Requena started for Clearwater for the third time in his career against Dunedin and picked up the victory with eight strikeouts over five innings innings of work. LHP Nick Allgeyer made his first start of the year for Dunedin and suffered the loss lasting just 4.2 innings. With their 16 strikeouts as a club, Dunedin has now struck out 36 times in the last two nights with 54 percent of their outs offensively coming via the strikeout in the infant stages of this young season. Dunedin will be looking for the series win tomorrow afternoon at Jack Russell Memorial Stadium. The first pitch will be thrown at 1:00. RHP Justin Dillon starts for Dunedin against RHP Andrew Brown for Clearwater.